ST. PETERSBURG – I need coffee in the morning. This has been true since my figure skating days and now on my early morning shifts in the newsroom. The kitchenette and hot water pot in my hotel room have been a blessing on my two-week stay. 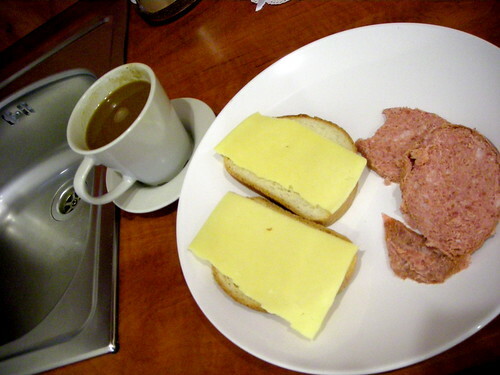 I can start off my morning with a hot cup of coffee and a small breakfast of bread, sausage and cheese. I’m not a huge fan of breakfast, but my morning ritual helped me survive my lectures. I like grocery shopping in other countries. It’s always a treat to see what other folks eat outside of the tourist zone. In St. Petersburg, I have learned to skip the extra fee for a plastic bag and use my backpack for shopping. After class, I treat myself to a culinary adventure. 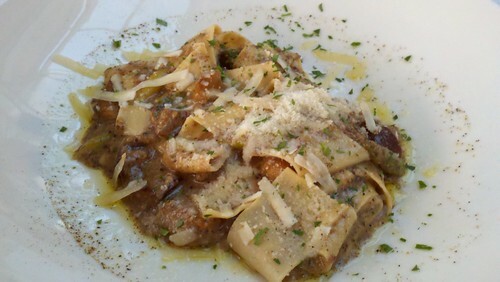 I enjoyed the savory sauce over the noodles, beef and white mushrooms at Terrassa. For my restaurant selections, I have leaned heavily on the iPod app for the Lonely Planet Guide to St. Petersburg. Lonely Planet led me to Terrassa behind the Kazan Cathedral. The menu covers “fusion” cuisine from Europe plus Japanese sushi and Chinese dim sum. 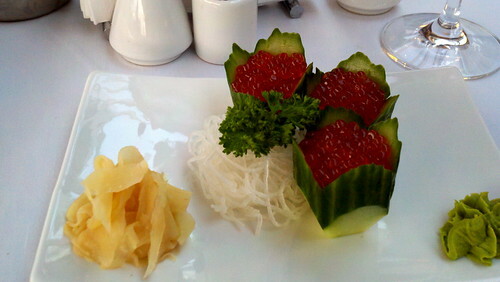 Many restaurants in this city, Russian or otherwise, offer sushi as an appetizer. I suppose, why not? If you have access to amazing fresh fish, sushi is one way to show it off. I thought it was challenging to work my chopsticks around this version of salmon roe sushi. Instead of seaweed and rice, I chewed through a cucumber shell. Still, good. Just different. Another big draw for me was the view from Terrassa’s patio. 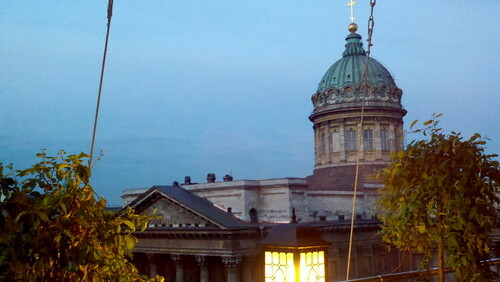 On a balmy night, I watched the sunset wash over the Kazan Cathedral, the Church of our Savior over Spilled Blood and the rest of Nevsky Prospect. Another night, I was craving a nice glass of wine. I found it at Les Amis De Jean-Jacques. This French bistro is tucked away from the traffic of Bolshoy pr. 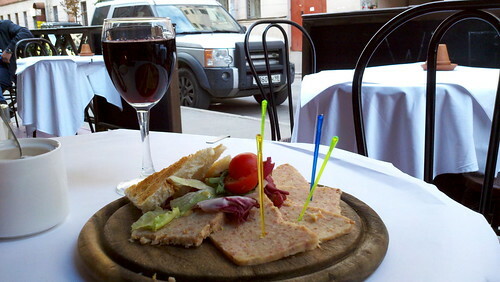 As I sipped a nice glass of French Merlot and lingered over chicken pate – it felt like I was back in my Paris neighborhood, sitting at a cafe next to the Centre Pompidou. At Les Amis, the servers were quite friendly. One felt terrible that the white paper over my table was covered with crayon scribbles. She kept smiling and apologizing (I think) as she swapped out the cover for a fresh one. I felt comfortable reading the Brothers Karamazov on my Droid X as I enjoyed this salmon fricassee. The fish tasted fresh and delicate. Sometimes, I needed to do extra work on my PowerPoint slides and videos for my lectures. So I dined in with instant ramen. Good grief. It feels like I will always find and buy my comfort food – from Mexico to Scotts Valley to Russia. My instant noodles came with a chicken flavor powder packet and dried herbs. Add hot water, wait five minutes. Next, I have dinner on my window sill. 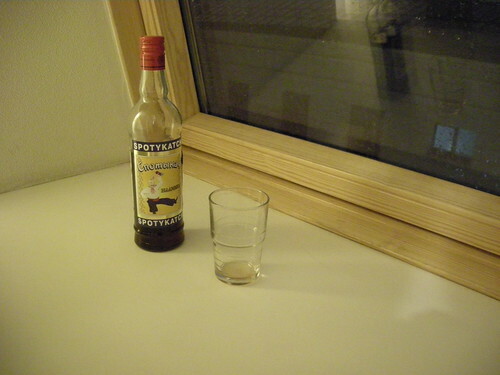 For creative inspiration, I had cheap Russian wine. It tasted like cough medicine with a smoky aftertaste. It was seriously cheap – only 80 roubles. Plus, it comes with 25 percent of something – not sure if that’s the alcohol proof or what. Still, I didn’t have hangover in the morning. 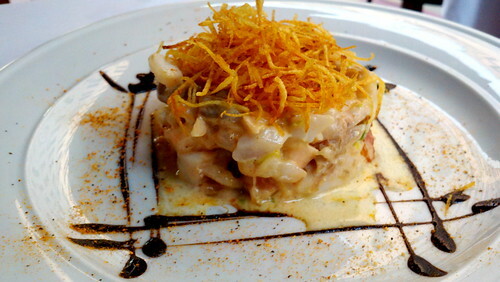 Terrassa is one of the best restaurants in St Petersburg. Did you try their dessert? Its probably the only place to find a brownie in the city. 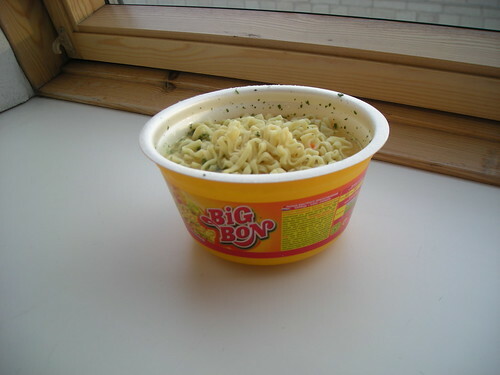 Big Bon is not bad, did you try Big Lunch? 🙂 Also, I’d note that, if you can find it, Georgian wine is really good but otherwise there is plenty of good wine from Chile in all shops around the city.